"Gaudi's use of space fractured all my previous concepts of architecture." Catalan architect Antonio Gaudi's work resembles the crazed visions of surrealist artists and sci-fi filmmakers. Even as I see them on the screen, it's hard to believe these are actual structures that exist in our world. Talented Hollywood art directors couldn't dream up the unique buildings, parks and interior decorations of Gaudi's best work. Born in 1852, the renowned architect has developed numerous memorable sites, most notably the Sagrada Familia in Barcelona. That cathedral was unfinished during his lifetime, and Gaudi's original plans were much more ambitious than the current grand incarnation. Before viewing this film, all I knew about Gaudi was this famous creation. But the Sagrada Familia is only a small piece of his work, which offers an outstanding collection of spellbinding designs. Japanese director Hiroshi Teshigahara might seem like an odd choice to film a documentary about an architect from Spain. His prominent work from the 1960s includes the classic Woman in the Dunes, which stands apart stylistically from nearly every movie. A pivotal aspect of that film is his collaboration with composer Toru Takemitsu, who employed all types of western styles to craft haunting music. His sharp, intriguing compositions also provide the perfect backdrop for Teshigahara's exploration of Gaudi�s architecture. Visiting numerous impressive structures, we follow an original travelogue through Barcelona and the Catalonian countryside. An early highlight is the Casa Battlo�which appears nearly devoid of any straight lines. Designed to follow the story of St. George and the Dragon, this unbelievable building is just one of the numerous memorable sites portrayed in this film. Our next stop is the Casa Mila (La Pedrera), which is actually an apartment complex built for a local married couple. The organic shape of this construction is like nothing I've seen before, and Teshigahara captures it perfectly inside and out. Calling this film a documentary fails to do justice to the Japanese filmmaker's unique take on the subject. He almost completely avoids the "talking head" approach and lets the images and sounds convey Gaudi�s skills. Some viewers might grow weary and want to know the history, but that information is available elsewhere. Teshigahara is more concerned with evoking the mood of each piece, which generates an invigorating experience. I would appreciate simple, unobtrusive titles naming each place, but further explanation isn�t necessary. Antonio Gaudi displays structures that are often more than a century old, but they rarely feel like historical relics. Instead, each creation lives and breathes because Gaudi moves opposite to most conventional approaches. We conclude with the Sagrada Familia, and the detailed look at this awesome monument goes beyond our expectations. Teshigahara moves the camera fluidly through the gargantuan structure and enhances the beauty of each spire. This intimate approach lifts this examination well past the standard historical documentary. Instead of just learning about Gaudi, we closely experience his work and gain a better understanding of his extraordinary abilities. 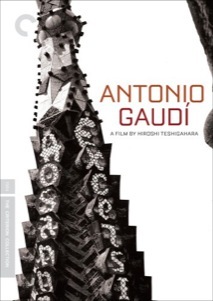 Image Transfer Review: Antonio Gaudi is a masterful visual work, and Teshigahara's success does translate well to the small screen. The full-frame transfer captures the feeling of visiting the remarkable architectural structures in person. The technology is limited by the 1984 release date, but it still maintains the right atmosphere. Audio Transfer Review: Although this Criterion Collection release only includes a mono transfer, it has been remastered effectively. Toru Takemitsu's beautiful, often jarring electronic score retains its luster even when projected through home speakers. His music drives this successful audio transfer, which is almost completely lacking dialogue. This short film provides 16mm footage of Hiroshi Teshigahara and his father's first trip to Barcelona and the outlying Catalonian countryside. This piece does not have sound, but it does present some looks at Gaudi's famous works. It also briefly depicts a visit to the home of Salvador Dali in Port Lligat. Isozaki is known for designing the Los Angeles Museum of Contemporary Art and collaborated with Teshigahara as the art director on The Face of Another. During this 2006 interview, he discusses meeting Teshigahara and working with him. We also learn some interesting details about Gaudi and the early Barcelona visit. This one-hour feature is the major drawing point of this disc and does not disappoint. Created as one of three installments of the BBC series Visions of Space, the presentation is newer and has a widescreen transfer. Art critic Robert Hughes returns to Gaudi's inspirations in Catalonia and strolls through many of the pivotal sites covered in the picture. There is plenty of gorgeous color footage that spotlights the architect�s remarkable talent. In addition, we discover intriguing details about Gaudi�s religious beliefs. As part of the BBC's arts TV series, this short documentary gives more background into Gaudi�s work. Some interesting black-and-white footage employs an off-screen narrator and presents the creative process. This 1963 short film from Teshigahara shows the installation of a sculpture exhibition at the Sogetsu Institute by his father Sofu. Beginning with black-and-white shots, the images are supported by crazy music that resembles the director's classic Woman in the Dunes. About halfway through the film, we shift to color and then everything goes crazy. The combination of color, light and sound is stunning and will stick with you for a long time. Criterion deserves high praise for the features of this two-disc special edition, which contains a 36-page insert booklet. This excellent supplement includes a chapter listing, several compelling articles and a short essay from the director about his first trip to the west. Antonio Gaudi continues to fascinate me long after my original viewing ended. Hiroshi Teshigahara crafts a completely original documentary that should interest both experts and novices. The Criterion Collection scores again with this exceptional two-disc release, which is highly recommended.